Brussels went into full lockdown mode following an apparent double terror attack that occurred at the Brussels airport and Maelbeek metro station earlier this week, not far from the European Union’s headquarters in the downtown city center. In early reports, the apparent ISIS-linked bombers, revealed to be brothers, allegedly blew themselves up in a double-suicide bomb attack in Brussels, Belgium’s capital city, at the main airport and a busy metro station downtown. Brussels issued a notice for an individual seen pushing luggage through the airport, along with the two other suspects now said to be dead. 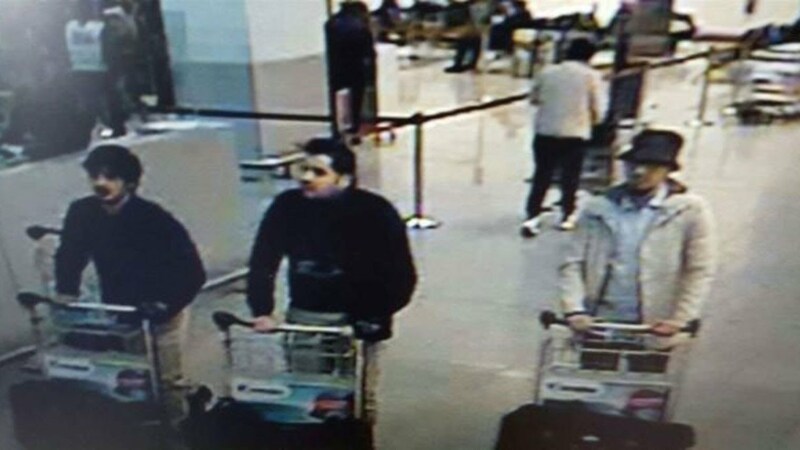 All three were allegedly seen on CCTV footage at the airport, in a highly coordinated attack that the terror linked media organization Amaq agency says was an ISIS attack. “Two other men, identified as Aboubakar A and Rabah N, were also charged with terrorist activities and membership of a terrorist group. Rabah N was also wanted in connection with a recent Paris raid when police said they foiled a terrorist attack. Third suspect or fourth suspect? 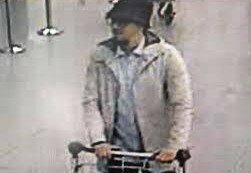 – Brussels issued a warrant for the man seen above (Faycal Cheffou) as the third person seen with pushing a cart of luggage with two of the other alleged attackers. “Laachraoui’s DNA was found on a suicide belt at the Bataclan music venue that was targeted by the terrorists along with an explosive device at the Stade du France. His DNA was also recovered at several safe houses in Belgium used by the cell. Interestingly, as of March 26th, it appears the narrative has changed again, as Cheffou, is believed to have fled after the airport explosions and that Laachraoui was killed on the scene. Also according to reports this week, the Maelbeek metro station explosion took place near some very important government buildings, including the EU’s main buildings, the European Parliament and the US embassy in Brussels – all of which, make the attack appear even more suspicious in nature, given the amount of security in the area on a daily basis. We’re told that the attack at Maelbeek metro, was less than two miles away from the US embassy, as both European Commission Headquarters and the Council of the European Union were around a 1,000 feet from the popular exit, Rue de la Loi. Additionally, the European Parliament was just under 2,000 feet from the bombed station. 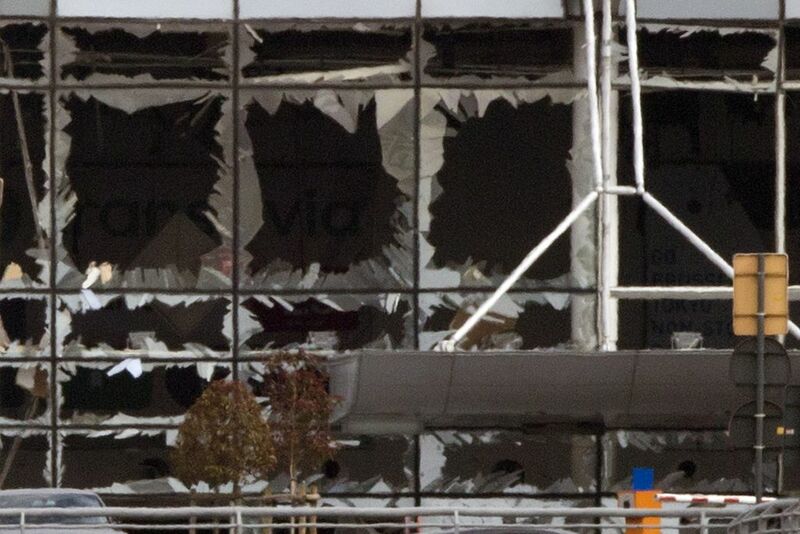 ‘Planted xplosives?’ – Blown-out windows mirror each other after an apparent suicide-bombing at Brussels airport. “A Belgian security official says the death toll has risen to 34 in attacks on the Brussels airport and a subway station. The official did not specify how many people were killed and wounded at each site. The official spoke on condition of anonymity because precise numbers were expected to be announced early Wednesday. Other media reports state there was a ‘twin blast’ in Brussels airport and one explosion at the metro station, downgraded to 31 killed in total as of March 24th. Though the Brussels attack appears somewhat different than the Hebdo shootings and Paris attacks of 2015, there are overlapping narratives to consider that tie all three events together. Perhaps most notably, we saw a similar radicalized brother theme during and after the Charlie Hebdo magazine shooting from January of 2015, as a jihadist duo allegedly carried out a major shooting attack in downtown Paris, only to be killed later in a six-hour standoff by police some 50 miles away from Paris. Soon after, it was then discovered that the Paris shooters also had a third accomplice following the heavily dramatized magazine shooting attack/siege. In fact, if you remember, it didn’t take long for investigators and media implicate the ‘Kouachi brothers’ (Cherif Kouachi and Said Kouachi) as being the two masked individuals seen fleeing the Charlie Hebdo offices, as Said’s identification had been ‘discovered’ laying on the seat of the apparent get-away vehicle, left perfectly intact near the Paris shooting as if by magic. It was then revealed, coincidentally or not, that there were major terror links discovered following the theatrical Paris shootings at the Charlie Hebdo magazine headquarters, as media outlets declared that Al Qaeda in the Arabian Peninsula (AQAP) had taken responsibility for the attacks – as well as helped to finance the apparent perpetrators, the Kouachi brothers. Then by a twist of fate, there was an allegedly ISIS-inspired attack carried out by the Kouachi brothers accomplice Amedy Coulibaly, who had released audio recordings and terror declarations via YouTube, professing his allegiance to ISIS, while he was supposedly working side by side with the Kouachi brothers, who claimed they were “financed by AQAP”, to carry out their part in the attack. To many analysts, this was an obvious attempt to shore up some of the loose ends within the Paris attack/siege narrative, while also performing the function to set-up Yemen as a central focus for the West’s next destabilization campaign – which is exactly what happened in the US sanctioned/Saudi-led airstrikes a year ago. If the Hebdo/Paris attacks were to be accepted at face value – it would mark a clear connection between AQAP and ISIS. It was no surprise then that this is exactly the narrative we saw formed over a year ago in Yemen. 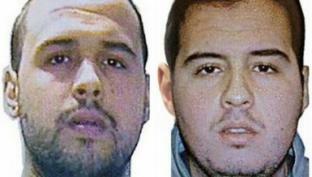 Then after all of the high-flying media confusion, we learned that authorities already knew the identities of the Kouachi brothers for at least ten years, as at least one brother was placed on a “no fly list” and both had been under police surveillance since Said Kouachi allegedly trained with AQAP in 2011. Following the second round of Paris attacks, French authorities launched a massive manhunt for “possible” eighth suspect in the terrorist attacks that killed 129 people and wounded more than 350 others. ‘Terrorist or Iinformant? – Salah Abdeslam, the purported mastermind behind November’s Paris attacks in 2015. 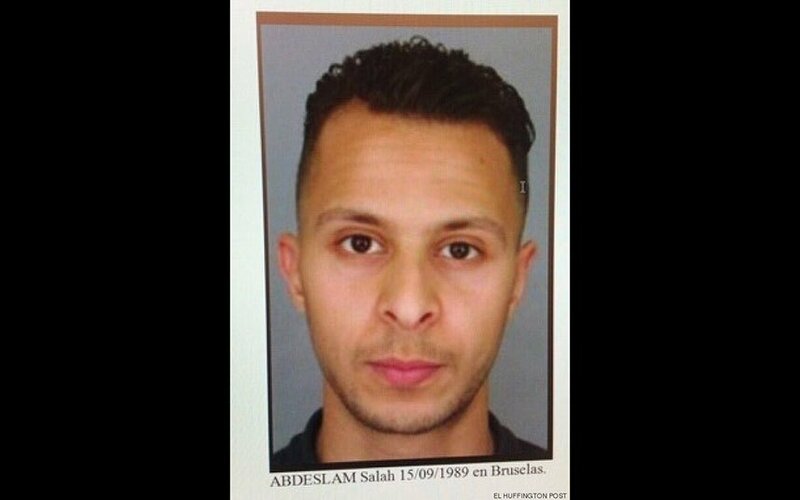 Paris Mastermind or Petty Drug Dealer? Belgium authorities had been routinely running anti-terror raids since the Charlie Hebdo attacks and double siege that followed back in January of 2015. In fact, Brussels renewed its raids in the aftermath of the Paris attacks from November of last year, while looking for the “most wanted man” in Europe, Paris attacks suspect, Salah Abdeslam. The Brussels attacks came just days after investigators apprehended Abdeslam, who had been hiding out inside a suburb very familiar to authorities in Brussels. In December of 2015, Belgium officials had believed they had pinpointed the area where Abdeslam had been holed up – but due to a law prohibiting nighttime raids (between 9pm – 5am) the so-called Paris attacks ‘mastermind’ alluded apprehension. This begs the question: How did Abdeslam, become mastermind of the Paris attacks, as his pedigree by all accounts, appears to be one linked to a life of petty thievery and drug deals? While this kind of story makes for an intriguing Hollywood drama, complete with all the cat and mouse hijinks, it’s more likely that Belgium officials were monitoring Abdeslam’s every move for some time over the last year and had already been seeking to change the security protocols about nighttime raids for sometime. According to VICE, it turns out police had been monitoring their prime suspect in the Paris attacks, after gathering intel from Abdeslam’s brother Brahim Abdeslam’s funeral, who, we’re told, had also participated in the attacks. Interestingly, Abdeslam’s brother’s funeral was some five months after the Paris attacks, and that authorities became suspicious of Abdeslam’s apartment as they were already watching it because “a large number of pizzas were delivered there,” according to both VICE and Politico. All across Europe ‘terror’ threat levels have been raised for maximum impact, with fear induced talking points led by US and UK leadership promising to put an end to this latest set of terror attacks coming out of Brussels. While many political leaders and media operatives continue to bang the drums of security over so-called terror ‘sleeper cells’ hiding in a nation near you – none of them will acknowledge the historical fact that they themselves have also helped to harbor, grow, foment and radicalize individuals through counter-terrorism operations for decades. Allied nations of course will bring up the fact that Western intelligence regularly uses double agents and informants under the banner of security to obfuscate the true intentions of such programs. According to officials, the Paris attacks were plotted in Brussels and as Mashable tells us, “In the fall, the neighborhood (Molenbeek) first became the focus of attention after it was revealed that the brothers Salah and Ibrahim Abdeslam, at the center of the Paris attack investigation, lived in the neighborhood. This presents the biggest question so far in this article: If we are to accept that authorities were monitoring Molenbeek and Abdeslam at least since the November Paris attacks, how is it that they sat on his arrest for five months, days before the double attack in Brussels knowing the danger that was out there? Additionally, from the beginning, officials presented that the Brussels attacks were a response to Abdeslam’s arrest, when the timing of the attacks could have also been attributed to a deliberate lapse in security, allowing attackers months of planning, uninterrupted by authorities – even when they had prior knowledge of those allegedly involved. “The security services knew, with a high degree of certainty, that attacks were planned in the very near future for the airport and, apparently, for the subway as well. 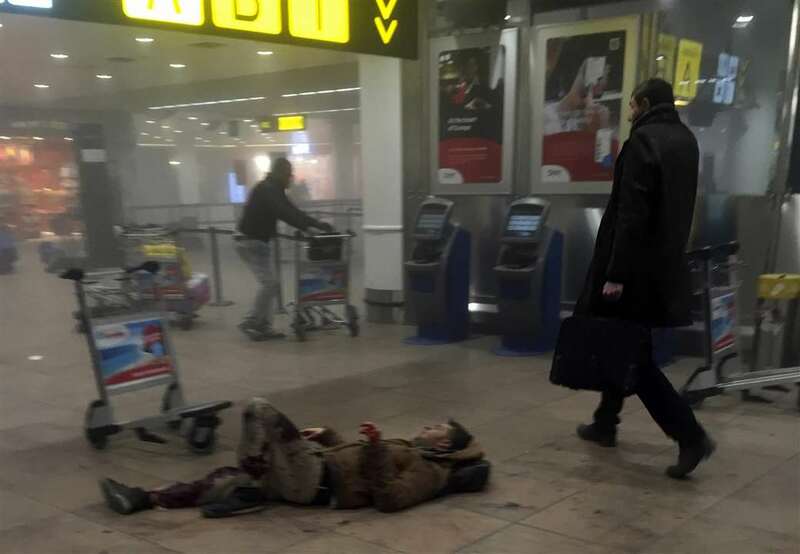 ‘Creating a scene?’ – A fellow passenger at Brussels Airport, causally walks next to a man in pain on the ground after an explosion. “One of the first videos published by Belgium’s mainstream media, was, according to reports, from the CC security surveillance cameras at Brussels airport. The video report was released at 9.07am, one hour after the first bomb attack at the airport. “The terror attack in the afternoon of March 22 at Brussels Maelbeek Metro station was reported by mainstream media including CNN. On one hand, authorities and their media counterparts want you to believe the terror attacks of today are some kind of unforeseen black swan event but the reality is, these incidents prove time and again examples of pre-planning and foreknowledge before an incident occurs. “Brahim El Bakraoui, one of the Brussels suicide bombers, was on a US counterterrorism watch list before the November attacks in Paris and his brother Khalid was put on the list shortly afterward, sources familiar with the matter said, Reuters writes. Many critics of today’s terror events, often cite the uncanny timing of security measures around the time of these incidents. The Brussels attack, appears to be no different, as the EU has been seeking a controversial ‘passenger name record system’ since at least the Paris attacks. The proposal has been met with much opposition, as some law makers are concerned about public privacy. Earlier this week according to the EUObserver (hat-tip Ger Anono), “EU interior ministers are expected to hold an emergency meeting in the wake of Tuesday’s attacks in Brussels, as European authorities try – again – to find ways to address the terrorism threat. The PNR was something which had been brought up after the first wave of Paris attacks. Additionally, in the wake of the attacks in Paris, there were open calls by US and UK leadership to gain access to encrypted data. Both President Obama and PM Cameron have agreed to stage cyber ‘war games’ and establish a joint cyber cell, to repel future hack attacks. This year, the nature of encryption has reached critical mass, as between the very public court battle with Apple and the FBI – as the security agency is seeking a more direct route into personal devices moving into the future. Just another coincidence? At those odds, it’s a near impossibility, and more likely we are looking at a role player of sorts. 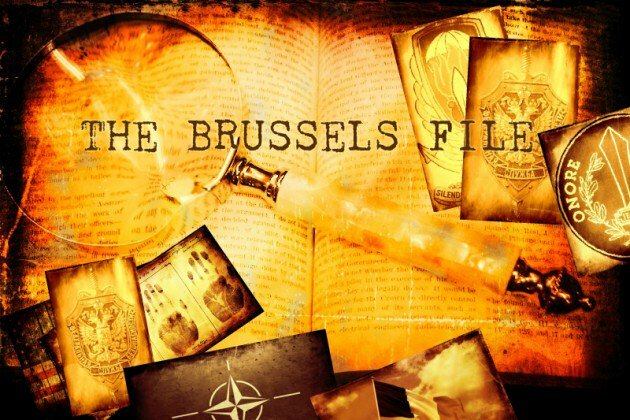 As 21WIRE has noted many time before, we’ve seen evidence of multi-agency drills or security exercises prior to other alleged attacks and shootings – was this the case in Brussels? “Police, firefighters and paramedics will this week work side-by-side with more than 70 partner agencies including local councils, utility companies and specialist search and rescue teams to respond to the disaster during the four-day drill. 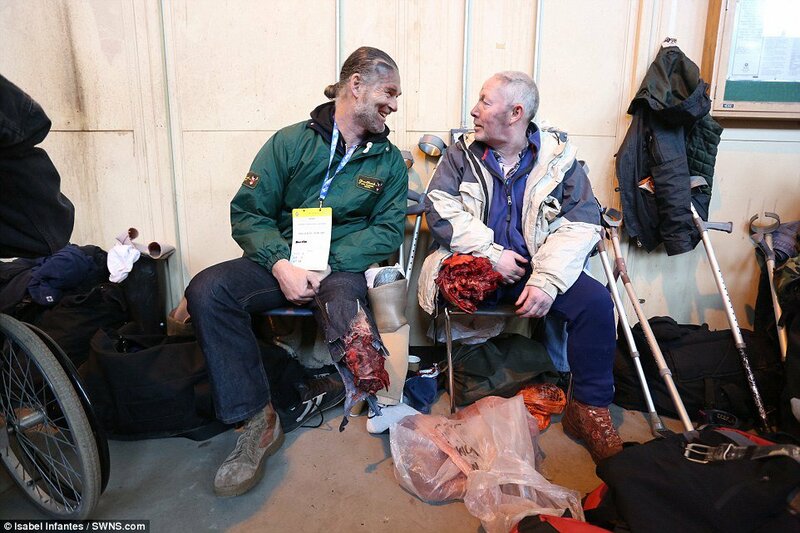 ‘Crises actors’ – Two actors with fake gory wounds seen here laughing in between playing their part in the exercise. What will be next for Brussels and other NATO countries moving ahead?